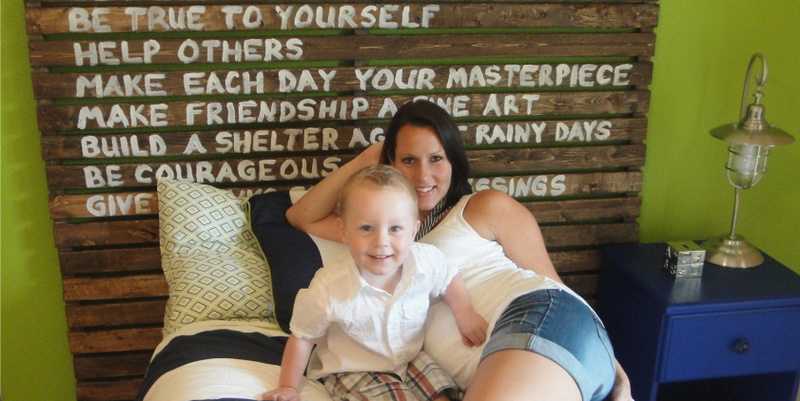 Thanks so much Megan for allowing me to share one of our DIY projects! My husband and I have taken up a recent love of "wooden pallet" furniture and thought it would be fun to try our very own. I am due with our fourth child in about 6 weeks, and we needed a big boy bed for our 2 year old son, Owen, so that we could use his crib for the new baby. So, that is what inspired us to make his bed! We wanted it to be something really special for him, so we decided to design it with inspirational words of wisdom for him to grow with! We came up with a few of our own phrases, and threw in some great, John Wooden phrases that his Dad gave to him when he graduated Elementary school. John Wooden kept this piece of paper in his wallet until the day he died! So, they must be pretty good "words of wisdom", right?!! First, we decided on the measurements for the headboard. We wanted it to fit a full size bed so we went with 50 inches tall X 60 inches wide. I recommend measuring your wall, you may have to come up with your own measurements to fit your space. We added 3 inches on each side to fit a full size mattress. (Disregard the fact that there is a twin size bed in the picture, we are waiting for his full size mattress to get here). I let my handy-dandy husband create the pallet for me, but of course he had little helpers too! They like to hammer in the nails. :) Brad cut the wood to size and created a square frame for the headboard and drilled screws into each corner to hold it together. 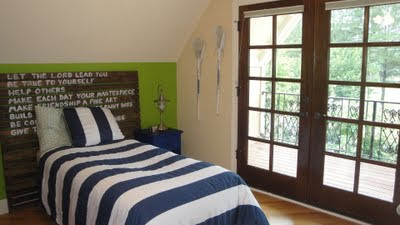 Then, he drilled a piece of wood down the center for stability and to give the headboard that "pallet" look. I got the job of the stainer and "free-hand" artist! I figured out after many tries with different brushes, that a regular paint brush is best for the job. The roller made the stain go on too thin and it would've taken forever! The sponge brush didn't give the stain the right consistency either, so though it took much longer, I used a paint brush to achieve my results and used a sponge brush in between the cracks to get those hard to reach insides of the wood. Once that all dried, I free-handed the phrases onto each slat of wood. Initially, I was going to use stamp letters and paint them white, to stamp the letters on nice and neat, but I couldn't find any that were large enough. So, bravely, I decided to free-hand it! !